The self-contained city of Masdar (under construction) is a beautiful concept. It reminds me a bit of the city and landscape of heaven. The only problem with building this on earth is SIN. Still, it’s fascinating and intriguing, a place I’d certainly like to tour one day. ABU DHABI, United Arab Emirates — Back in 2007, when the government here announced its plan for “the world’s first zero-carbon city” on the outskirts of Abu Dhabi, many Westerners dismissed it as a gimmick — a faddish follow-up to neighboring Dubai’s half-mile-high tower in the desert and archipelago of man-made islands in the shape of palm trees. 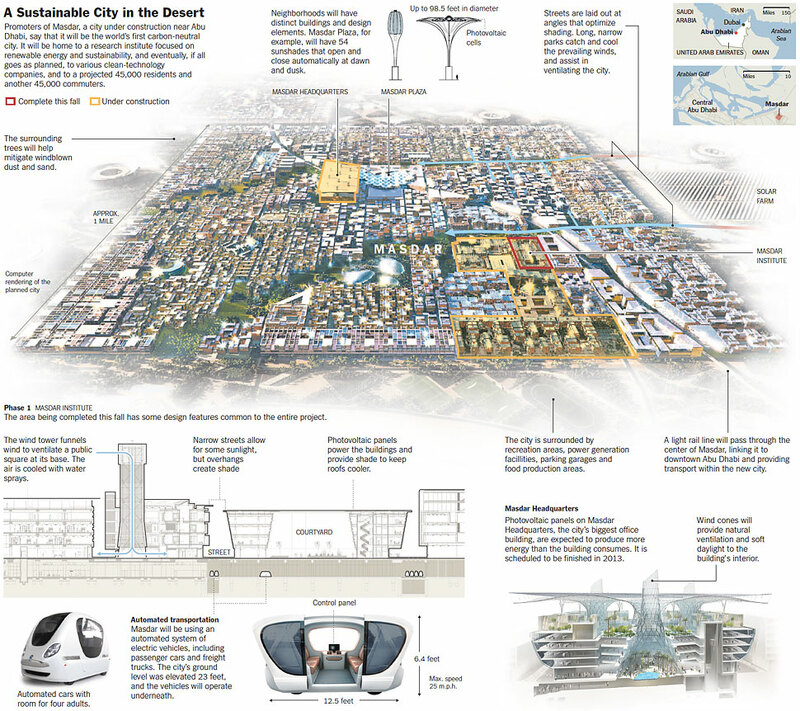 Designed by Foster & Partners, a firm known for feats of technological wizardry, the city, called Masdar, would be a perfect square, nearly a mile on each side, raised on a 23-foot-high base to capture desert breezes. Beneath its labyrinth of pedestrian streets, a fleet of driverless electric cars would navigate silently through dimly lit tunnels. The project conjured both a walled medieval fortress and an upgraded version of the Magic Kingdom’s Tomorrowland. Well, those early assessments turned out to be wrong. By this past week, as people began moving into the first section of the project to be completed — a 3 ½-acre zone surrounding a sustainability-oriented research institute — it was clear that Masdar is something more daring and more noxious. Norman Foster, the firm’s principal partner, has blended high-tech design and ancient construction practices into an intriguing model for a sustainable community, in a country whose oil money allows it to build almost anything, even as pressure grows to prepare for the day the wells run dry. And he has worked in an alluring social vision, in which local tradition and the drive toward modernization are no longer in conflict — a vision that, at first glance, seems to brim with hope. Click on the link to read entire the article and associated media – fascinating.